Stir the water, milk, and quinoa together in a saucepan; bring to a gentle boil. Reduce heat to low and simmer 5 minutes, or until the quinoa begins to soften. 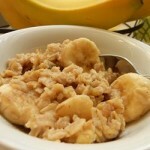 Stir in the banana, rolled oats, oat bran, salt, and cinnamon. Cook, stirring frequently over low heat for 2 to 5 minutes or until the mixture thickens. Remove from the heat and stir in the walnuts, brown sugar, and vanilla. Smoked salmon and egg whites on a toasted whole-wheat English muffin is the perfect power breakfast. 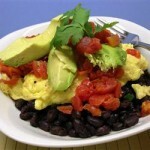 For a more substantial meal, pair it with a piece of fruit or a glass of 100% juice. Heat oil in a small nonstick skillet over medium heat. Add onion and cook, stirring, until it begins to soften, about 1 minute. Add egg whites, salt and capers (if using) and cook, stirring constantly, until whites are set, about 30 seconds. 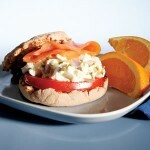 To make the sandwich, layer the egg whites, smoked salmon and tomato on English muffin. A smaller cousin of the breakfast burrito, the breakfast taco made with reduced-fat Cheddar and egg substitute is a satisfying and healthy breakfast option. Top tortillas with salsa and cheese. Heat in the microwave until the cheese is melted, about 30 seconds. Meanwhile coat a small nonstick skillet with cooking spray. Heat over medium heat, add egg substitute and cook, stirring, until the eggs are cooked through, about 90 seconds. 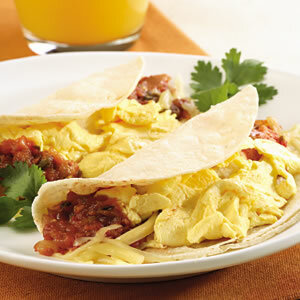 Divide the scrambled egg between the tacos. 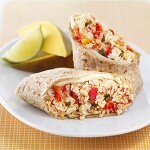 Even though this healthy breakfast burrito comes together in just 5 minutes, you can make this burrito even faster by skipping the skillet and combining the tofu, salsa, salt and pepper in a bowl and microwaving until hot, about 1 minute. Use soy cheese to make it a vegan burrito. Heat oil in a small nonstick skillet over medium-high heat. Add tofu and cook, stirring occasionally, until beginning to brown, about 2 minutes. Stir in salsa, salt and pepper; continue cooking until heated through, about 30 seconds. Spread cheese down the center of tortilla. Top with the tofu mixture. Fold in the ends of the tortilla and roll into a burrito. This meal-in-a-glass smoothie is bursting with berries and orange juice, healthful sources of carbohydrate and powerful antioxidants. Getting plenty of antioxidant-rich foods makes sense for active people, since free radicals are produced any time the body’s cells process oxygen. 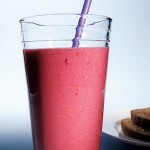 Place berries, yogurt, orange juice, dry milk, wheat germ, honey and vanilla in a blender and blend until smooth. 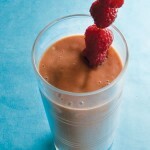 Puree avocado, orange juice, raspberry juice and raspberries in a blender until smooth. Physicians Medical Group of San Jose, Inc. (PMGSJ) is a dedicated group of physicians who joined together in 1980 to form an Independent Physicians Association (IPA) for the purpose of providing health care to their patients who were enrolled in Health Maintenance Organizations (HMOs) or Preferred Provider Organizations (PPOs). © 2013~2018 Physicians Medical Group of San Jose, Inc.